Check it out, I’m featured in today’s SF Chronicle, as a co-worker at Sandbox. Interesting one of the interviewees mentions the possibility that Starbucks could start co-working spaces themselves. I was just thinking that myself last week. Though it’s really nice to go to a more homey, grassroots kind of place like Sandbox. We saw Mika perform yesterday, with Lisa and Wai. It was amazing. He’s a fabulous performer, and so much fun. 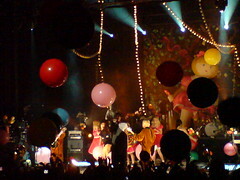 This shot is from the last song, Lollipop, which involved animal mascot costumes, shadow puppetry, oversize lollipops, a giant inflatable little girl, tons of confetti and big balloons. It was interesting to see the mix of fans — all ages, families with kids, gay couples, etc. Our cat caught fire yesterday. 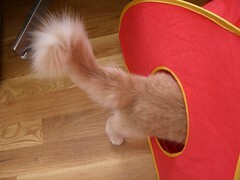 I glanced over and saw her fluffy tail ablaze, like one of those red hot poker flowers. Butters had jumped onto the counter and waved her tail over a lit candle. I grabbed her in a panic, but the fire was already out. We brushed all the black balls of burnt hair off her. Fortunately the fur was so thick, the fire never reached her actual tail – she never even noticed she’d been on fire. We’ll have to be more careful. 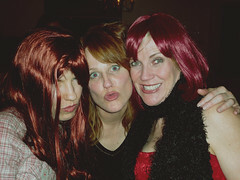 A dignified image from Susan’s party.